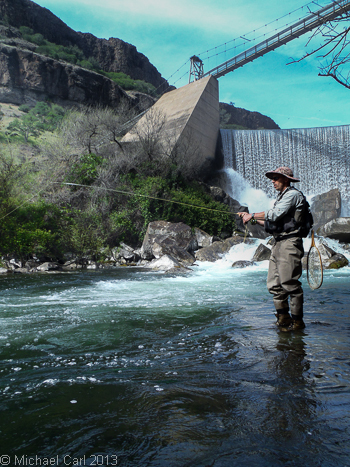 The fishing season for the stretch of the Lower Stanislaus River between Goodwin Dam and the Highway 120 bridge in Oakdale is January 1st to October 31st. From the City of Stockton drive south on Highway 99 toward Manteca. Once you reach Manteca take Highway 120 heading west (e.g., toward Yosemite National Park). Drive about 30 miles west and you'll come to the town of Oakdale. Drive through Oakdale and continue west for 13 miles. As highway 120 enters the foothills keep a close eye out for "South Shore of Lake Tulloch". It's a left turn off the highway and comes up quick after the sign. Follow this road "Tulloch Dam Road" until you enter Goodwin Canyon and you'll look for the restrooms just off the road and past a cattle guard. 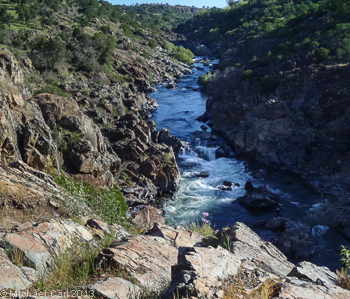 In the 1880's, Charles H. Tulloch purchased water rights and a ditch which was a small diversion dam built by early miners for use in Placer gravel workings in the Knights Ferry vicinity. Local farmers extended the ditch, known as the Old Tulloch Ditch, down into the valley area to service 6,000 acres of farm land. The ditch and water rights were purchased in 1910 by Oakdale Irrigation District and South San Joaquin Irrigation District for a total price of $650,000. Each district acquired vested water rights to the Stanislaus River aggregating 908.3 second-feet of natural flow diversion. In 1912, the two districts began construction of Goodwin Diversion Dam - named for Benjamin Goodwin, then president of the SSJID board. The dam was constructed at a cost of $325,000 and was a double concrete arch dam, 80 feet in height above the river bed and 500 feet long on the crest. Water was first delivered in 1913 when Goodwin Dam was completed. From this dam, each district constructed main canals extending to their respective lands. The dam and the canals are present today and from the tailwater fishery on the lower Stanislaus. As a tailwater serving the needs of farmers in the valley below, the Stanislaus River below Goodwin is subject to major flow changes. In general, the opening of the season on January 1st to early Spring will have varied flows ranging from 400 to 6000 cfs. Once the Sierra snow pack begins to melt in April to early summer, the releases will spike from Goodwin - ranging from 2000 to 6000 cfs. The run-off will vary from year to year. Once the snow run-off has peaked, the flows will simmer down and range from 200 to 1200 until the seaon closes on October 31st. All that said, it's best to carefully watch the flow information here before heading to the river. Access to the lower river is limited. 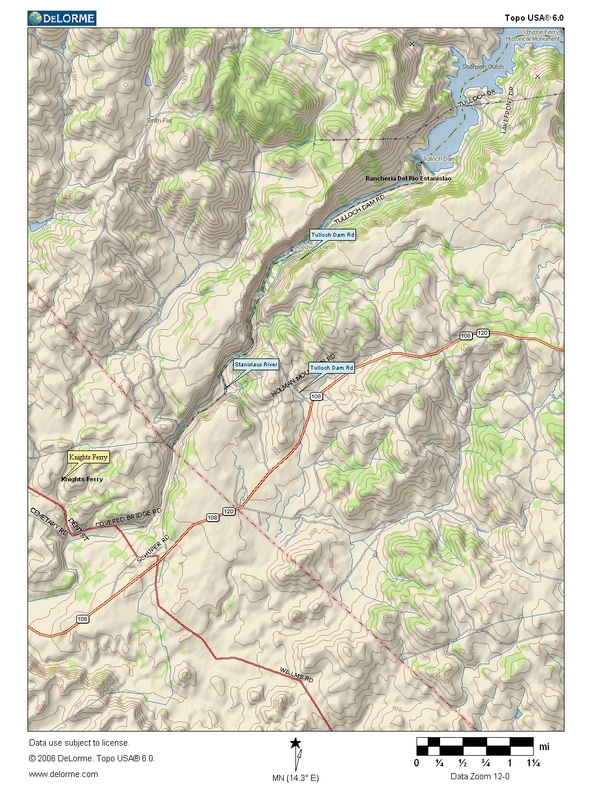 The two factors contributing to this are: (1) Goodwin Canyon is a confined gorge, and (2) a deep irrigation canal running in parallel to the river which acts like a castle moat. Public river access can be found at either Goodwin Dam or Two Mile Bar. To reach Goodwin Dam follow the sign for South Shore of Lake Tulloch off of Highway 120. It's a short drive down into Goodwin Canyon. Look for a restroom just pass a cattle-guard on the left. Parking is extremely tight here. Two Mile Bar is further downstream of the Goodwin Dam access point. To reach it from Goodwin Dam, double back to Highway 120 and drive west toward Oakdale. It's a mile or so, and the sign for Two Mile Bar is very small, so watch carefully. The Army Corp of Engineers acquired the road and parking access in the middle of private ranch land - so we can thank the Corp for that! 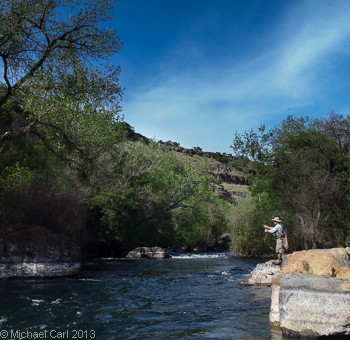 The Stanislaus River downstream of Goodwin Dam to the Highway 120 bridge is managed as a wild trout fishery by C.D.F.G. The season runs from January 1st to October 31st. 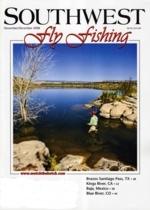 Anglers are only permitted to fish with barbless hooks on either flies or lures. 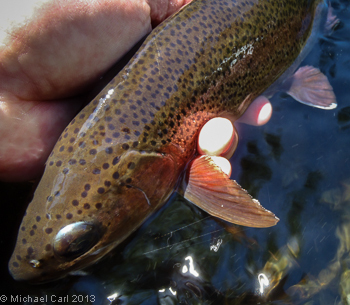 And most importantly, the lower Stan is a catch-and-release fishery. Spend time on this water, and you'll see the benefits of these regulations as the rainbows grow bigger and get tougher to fool.